The outings to Kelburn and the Titan have been noted in this main stream of postings, but what was arguably the best outing of the summer, to the Isle of May in the Firth of Forth, seems to have been missed out. 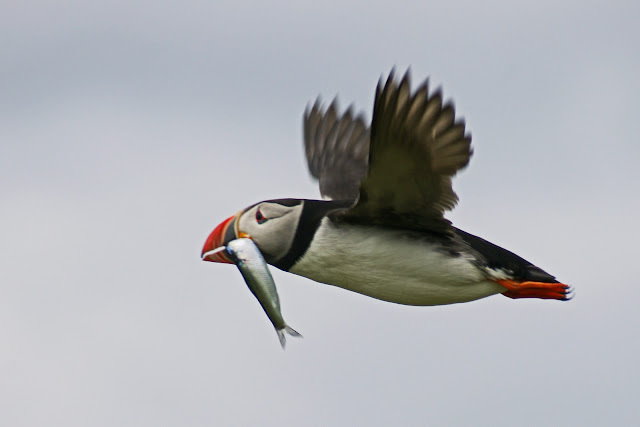 To rectify this, here's a picture I took on the island - "Puffin in Flight, with Capelin". I know it isn't pin-sharp, but it was taken while panning with a telephoto lens, at f7 with a shutter speed of 1/800 of a second. The bird was passing at an estimated 40mph - they can fly at speeds up to 55mph, with wings beating at a rate of 300-400 per minute (5-7 beats per second! ), so in-flight pictures are something of a challenge!